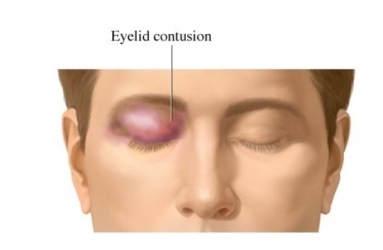 An eye contusion is a bruise around the eye, more commonly known as a black eye. It may result when a blow happens in or near the eye socket. If a bruise appears, it will usually do so within 24 hours of the injury. After being struck in the eye or nose, blood leaks into the area surrounding the eye. A black and blue or purple mark will appear following the injury. There may also be redness, swelling, and tenderness or pain. After it begins to heal, the contusion may turn yellow. Eye contusions are diagnosed visually. Healthcare providers assume that the eye has been struck in some way. Most people are able to self-diagnose a contusion, but a doctor may confirm the diagnosis. It is important to apply first-aid treatment right away. Seek emergency medical attention right away if there is any concern that the eye has been injured. Immediately apply an ice pack for 15-20 minutes at a time to reduce swelling and minimize pain. Do not press on the eye itself. Repeat every 1 to 2 hours for the first 48 hours. If there is still tenderness after 48 hours, apply a warm compress every 1-2 hours. Take acetaminophen for pain. Do not take aspirin or nonsteroidal anti-inflammatory drugs (NSAIDs) like ibuprofen because they can cause or increase bleeding. If the skin around your eye is cut, you may need stitches. If there was any damage to the eye itself, you may need antibiotic eye drops to prevent infection. Your doctor may prescribe eye drops to minimize swelling. Wear protective eye covering such as safety goggles whenever the eye is exposed to potential injury at work or play. The best eye coverings fit snug against the skin so that no foreign objects can get underneath them and into the eye. Avoid situations that may involve fighting. Many cases of black eyes are the result of domestic violence. If you suffer from any form of domestic violence, verbal or physical, talk to your doctor or call a domestic violence hotline right away. Do not feel alone or threatened. There is help available. Eye injuries. Kids Health—Nemours Foundation website. Available at http://kidshealth.org/parent/firstaid%5Fsafe/emergencies/eye%5Finjury.html. Updated September 2014. Accessed May 6, 2016. What is a black eye? Eye Smart—American Academy of Ophthalmology website. Available at: http://www.geteyesmart.org/eyesmart/diseases/black-eye.cfm. Updated March 1, 2015. Accessed May 6, 2016.